Organize your digital and analog life with green technology and smart design. First tablet case with solar-charged powerbank and paper planner and calendar. No more use of fossile fuels! Solar panel charges a built-in powerbank. Out and about a lot? Never be without power for your devices. Just plug them into the powerbank. Enjoy analog and digital lifestyle side by side, use your tablet and write down your notes. Designed, researched, tested and manufactured with love in Germany. What can you do with your Solar Planner? Collect solar energy by placing the solar panel into direct sunlight. You can raise it at a 45 degree angle for better exposure! Sun power is stored in the flat powerbank built into the back cover. On rainy days charge your powerbank at any electric outlet and you’re good to go. Use the attached charging cord to charge your device or connect to the USB port using your own cord and charge when and how you like it. Indoors or at night, wherever you need it. Store your tablet securely in the hard shell frame. You can easily remove the whole frame from the ring binder or raise it for viewing at a convenient angle. Keep your important items close at hands: tickets, notes, business cards. You never know what today will bring!! Organize your activities, write and draw - all inside your planner and note pages. Boost your productivity by active, old-school analog note-taking when reading an article or viewing a video. Small, removable keyboard for a comfortable writing experience with your tablet. Powerful solar panel with 22% efficiency. 10 Watt/peak. Needs ca. 4-5 hours to charge the battery. 8800 mAmp super-flat integrated powerbank charged by solar panel. Enough load to charge a tablet or a phone in 4-5 hours. Powered by solar energy or charged at any electric outlet. Two USB and one micro USB jack included. Attached charging cord with dual tip for convenient connection to your device. 360 degree rotation for optimal viewing. You can raise it for easy viewing and take out of the planner by the ring mechanic for use on the go. Available for various tablet types and sizes. Plan your day, jot down a few notes or scribble away in a ring-bound paper planner, calendar and notebook. Plus keep your business cards, essential documents, tickets, cute photos or notes in extra slots. Tuck your favorite pen into the elastic pen loop or store a slim keyboard to use with your tablet. 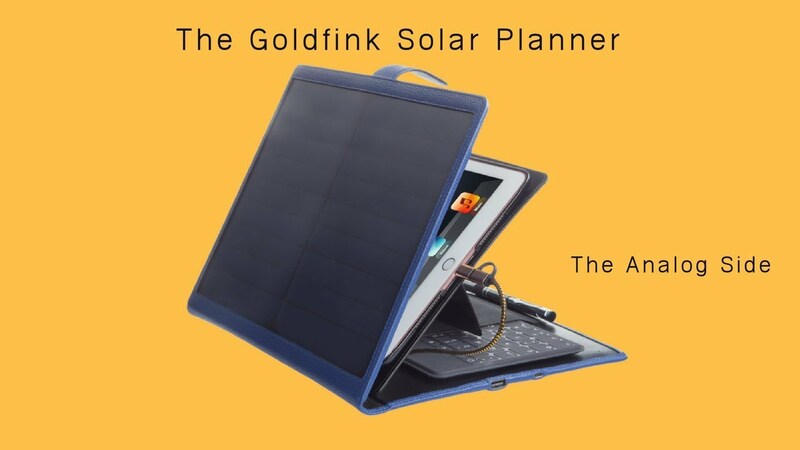 Goldfink creates innovative tools for everyone to make smart, sustainable choices. We create solar accessories, bags and wearables for everyday heroes, travellers, urban nomads, dreamers and geeks, at home in the analog and digital world alike. Goldfink designs are hybrid companions for your analog and digital lifestyle. Sourcing the latest materials and production methods and collaborating with small, local manufacturers we combine smart technology, intelligent design and eco-conscious mindfulness. Join us with your Solar Planner and share your travels and adventures. Join to be among the first to receive infos and pre-launch discounts. Never any spam. Unsubscribe anytime.